A few weeks ago I mused on Attack on Titan’s ability to mobilize the tropes of Neon Genesis Evangelion. Fun as it was to write a piece that walked the line between genuine commentary and tongue-in-cheek sniping, it didn’t really offer much in the way of a meaningful review. So after a small delay, I now present you with my review of Attack on Titan’s first season. The story begins in the last remaining city on the planet. For more than a century, humanity has huddled within a kingdom built inside three concentric walls, safe from the Titans – a vicious race of giants that feed on humans. While the idea of monsters eating humans is nothing new, turning those monsters into dough bodied, smiling morons is something of a deviation from the norm. With rare exception, the Titans have an almost childish look to them. Watching one grin like a toddler as they bite a person in half defines Attack on Titan as a unique take on the man vs monster trope. Unlike the Angels of Evangelion, whose threat is rooted in a supernatural narrative, the Titans are built upon the much simpler, but similarly effective, notion that there is always a bigger fish. When the series reveals that the Titans feed on humans purely out of blood lust, their innocent demeanor becomes all the more menacing. Consider that a zombie feeds on impulse, a Titan does it to revel in drinking blood, chewing on man-meat, and then puking it all out when its belly gets too distended. The series also boasts a sprawling cast. As the primary triad of Eren, Mikasa, and Armin go from raw cadets in the King’s army to members of the elite Scouting Legion, many secondary characters come and go, and most of those who go are eaten by Titans. Yet none of these characters ever feel like redshirts. They all have names, too many names to remember quite honestly, and their deaths inform the larger sense of hopelessness that underwrites the story. 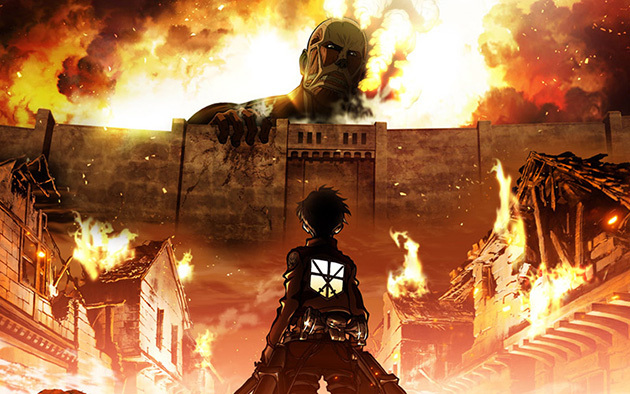 As is the case with most anime that touches upon war, Attack on Titan is pretty direct, bordering on heavy handed, in its treatment of people in combat situations. With a century of Titan-free life as the backdrop, the majority of the kingdom’s military is woefully corrupt and/or incompetent. The first episode sees a member of the city guard drop his swords and run when faced with his first real Titan encounter. The prolonged peace makes even those with the best of intentions tremble before the prospect of real combat. During his first combat operation, Armin is paralyzed with fear after witnessing a Titan swat one of his comrades out of the air and eat him. These examples, however, are only the beginning. The deeper Attack on Titan gets into humanity’s perpetually losing war with the Titans, the more those fighting the war grow discontent with their lot in life. Humanity’s army begins to look a lot like the Soviet army in World War Two, where Commissars with pistols stood behind the men and threatened immediate death in the face of probable death. All too often in anime we see the soldier archetype defined by their willingness to fight and die for the cause. While the Scouting Legion certainly embodies that principle, the mainstay of humanity’s military is cowardly and weak. This transition from individual weakness to the failings of the whole helps keep the writing from banging too hard on the drum of human misery, and adds a refreshing subversion of anime’s love for the selfless soldier. Even though the first season is broken up into distinct story arcs, which in and of themselves do a great job of keeping a clear narrative focus for the larger story, the overall pacing of the series isn’t perfect. It’s not quite as bad a Dragonball, where five minutes of story time can take five episodes to unfold, but there are moments when I finished an episode, and wondered if they couldn’t have made better use of their time. Do we really need to spend five minutes focusing on Eren’s inner turmoil amid a battle? Broadly speaking, it’s great for character development, but it comes at the price of some episodes moving at break neck speed, and a few that tend to meander from start to finish. All this amounts to a series that easily lends itself to binge watching, and then raging because the second season isn’t even in production. 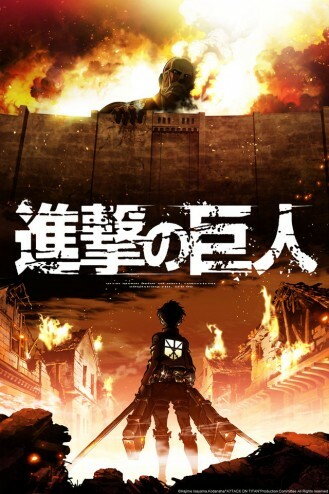 Anybody who liked Evangelion, will likely find Attack on Titan to be to their tastes. While I still have a few lingering critical questions that would require a closer re-watch – e.g. does this series actually pass either the Bechdel Test or the Mako Mori test? – I have no qualms about recommending this series for veteran anime fans and newcomers alike.